Angela McArthur joined Stirling Properties in 2014 in the Commercial Brokerage division located in the Mobile office. She has represented a wide range of local, regional and national clients, with expertise in the areas of retail site selection and acquisition, as well as many other fields such as sales and leasing, property management, buyer/tenant representation and corporate leasing services. These services have been successfully accomplished with all types of commercial properties including restaurants, retail centers and office. Mrs. McArthur started her career in 1998 in real estate in the Property Management division of Herman Maisel & Co., a local owner of shopping centers and office holdings in Mobile, Alabama. 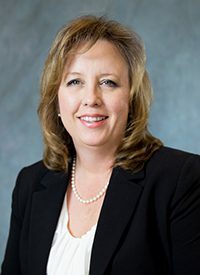 She moved into large shopping center management and leasing when she joined Konover & Associates South in 1990, in the position of Assistant Manager of Konover’s Mobile and Upper Panhandle Holdings in Florida. Moving into brokerage in 1997, Angela joined Prudential Cooper & Co.’s Commercial Department initially in property management and leasing, moving into commercial sales, investment sales, tenant/buyer representation and corporate leasing services in 2000. A member of ICSC, Angela currently serves on the 2017 ICSC P3 Planning Committee, an initiative created by ICSC to promote better relationships and partnerships between the private sector and the public sector in retail real estate. She is a member of the Mobile Association of Realtors, NAR and Mobile Commercial Exchange Club. In addition to professional roles, Angela enjoys volunteering for the “Save the Beach” program. This program helps to protect the nesting sea turtles and their habitat under US Fish and Wildlife Service, utilizing the federal endangered species guidelines.